If you’re looking for both blending and food processing capabilities, a blender food processor combo is an excellent way to get more for your money, and save on kitchen storage space. Usually costing only slightly more than a blender, these combined systems provide a huge range of capabilities: make smoothies, doughs, fries, salads… the list is endless. 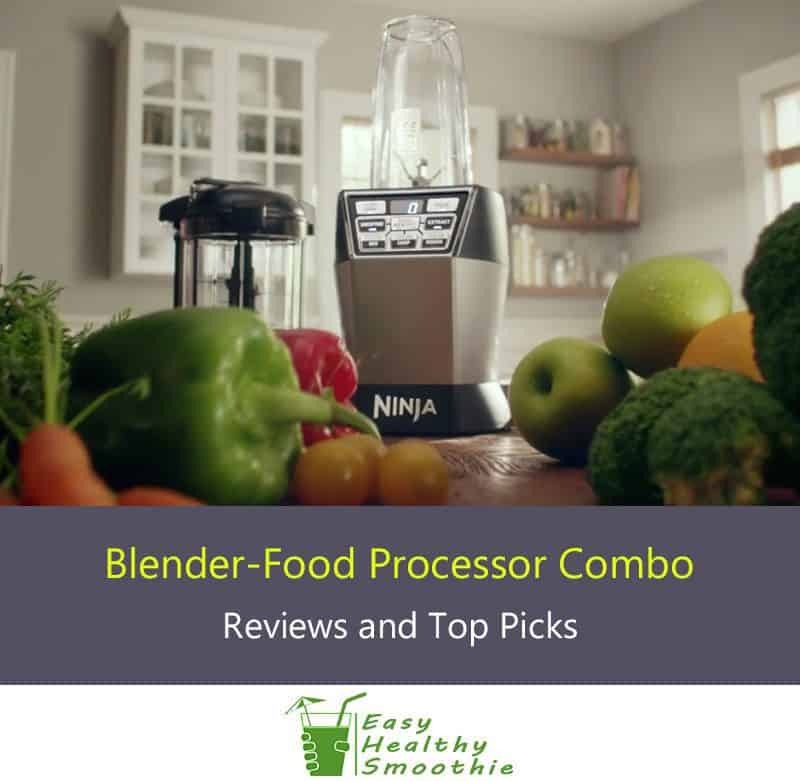 Here I’ve reviewed the top picks for blender food processor 2 in 1, and also included a helpful buyer’s guide with what to look for when selecting your new appliance. Read our full review on the Oster Pro here. What is a food processor and why use it? What is a blender and why use it? Related: Read our full review on the Ninja Mega Kitchen System here. If you’re looking for a blender and food processor all in one, there are a lot of choices, and making the right selection can be a daunting task. To help you pick the right appliance for you, I’ve provided a review roundup of some of the best systems out there. Packing an impressive 1200-watt, 2-HP motor, the Ninja Mega is a complete system for healthy living. Included are a 72-ounce blender pitcher, 8-cup mixer bowl, and two 16-ounce nutri-ninja cups for personal blending! Overall a great system for the money! The Cuisinart BFP-10CH PowerBlend Duet features a 56-ounce blending jar and three-cup mixing bowl, which both attach to a 600-watt, 7-speed motor. With LED touchpad controls and a sleek design, the Cuisinart Duet looks great and is easy to use. If you’re making smoothies, it’s best to add liquid ingredients first. The blender may also work best when the jar isn’t filled to the top, so make large quantities in two separate batches. At 1200 watts, the Oster Pro 1200 Blender 2-in-1 packs a powerful punch, and is able to handle the toughest recipes - all at a very modest price point. It might be your best combination appliance for the money. The Oster Versa is great for making smoothies! The smoothie presetting turns off on its own when finished, allowing for no-fuss, hands-free blending. Unique from some of the other systems on our list, the Black & Decker is a true combined mixer and blender, as it only has one 10-cup jar with different attachments for blending and food processing purposes. At 500 watts, the motor doesn’t pack quite as much of a punch as some of its competitors. The Ninja Nutri Bowl DUO packs a wallop at 1200 watts, and can handle the toughest ingredients including nuts and frozen fruits. The food processor even makes dough, so this could be considered a blender mixer combo as well! This system includes a 4-cup food processor and two 24-ounce single-serve blending cups. It’s ideal if you’re looking for a personal blender to make smoothies and also want to do some quick food mixing. The base unit has presets for smoothies and food processing, with Auto-iQ technology that combines blending, pulsing and pausing patterns for hands-free blending and food processing. This is one of the cheapest blenders on the market, yet still has excellent functionality. Powered by a formidable 700-watt motor, the Hamilton has enough power to handle tough ingredients such as ice and frozen fruit. This system comes with a 40-ounce glass jar with a patented no-mess pouring spout. Twelve convenient presets for drinks, purees, chopping, grating and more make for hands-free blending and perfect result every time. I’m going to go with the Ninja Mega Kitchen System. This system is so versatile, and can handle just about any blending or food processing job. All of this might leave you asking should I get a blender or food processor, or both? Today’s market is saturated with offers for all three types of appliances, so selecting the right appliance can be a daunting task. Not to worry - I’m here to help! This buyer’s guide can help you decide which appliance is right for you, and learn which features are important to look for. A food processor usually consists of a wide-mouth bowl, often with a cute attachment to the lid that’s used to feed in solid ingredients. They usually come with several blade attachments for cutting, chopping, slicing, shredding and even dough hooks. This kind of appliance is best for chopping, slicing and grating solid foods to make recipes such as salsas, coleslaw or hummus (my favorite use!). A countertop blender usually consists of a pitcher with rotating blades at the bottom. Many blender jars are also narrow at the bottom, creating a vortex that brings ingredients into contact with the blades more frequently. A blender is best for turning solid ingredients like fruit and vegetables into liquid smoothies or purees. It’s also best for combining liquid ingredients with solid. Although blenders and food processors are similar appliances, both have different applications, and there’s less crossover than you might imagine. Buying both in one saves a substantial amount of money. Using a combination machine reduces food prep time. It offers more functionality and flexibility. These are the most important points that you should look for in a combo, and the ones we considered when evaluating the appliances in this roundup and picking the top performers. The capacity refers to how much food your system can process at once. If you’re looking to make family-sized portions, you’ll want to choose a combination food processor-blender with the most capacity possible. Depending upon how much kitchen space you have, you’ll also want to keep an eye on size and storage space. The power refers to how much power the base unit’s motor has. If you’re looking mainly for food processing and to make the occasional smoothie, 700 watts should be sufficient. Less than that, and the machine tends to struggle with anything tougher than soft fruits. If you would like to process tougher ingredients such as nuts, you’ll want upwards of 1200. For maximum functionality, you’re best off with a system that has a wide range of speeds, with slower speeds for chopping and slicing, and high speeds for blending tough ingredients such as ice. These combined machines are generally quite versatile with many functions. You’ll want to prioritize based upon your needs and what you plan on making. Pre-programmed blending and food-processing settings are ideal, as they allow for hands-free blending, and may also produce better results than manual controls. Check out my product reviews above to see how loud each prospective model is. In general most systems make about same amount of noise as a normal blender, and are noisier when blending tough ingredients such as ice. Cleaning is easily the least fun part of cooking, so you’ll want to select a system that’s as easy to clean as possible. Ideally the bowls and attachments should be dishwasher-safe, and the base unit should be sleek and easy to wipe down. You’ll want to select a system that has a proven track record of durability, and is also backed up by a manufacturer's warranty in case of any manufacturing defect. The duration and terms of warranty can vary not only by manufacturer but also by model, so be sure to do your homework. There are many accessories available for these all in one machines. Most systems include at least a few of the following. In the end it comes down to what you’re planning to make with your new appliance, but make sure you select one with the accessories required for recipes you plan to make often. Mill: A mill is usually a separate bowl attachment that’s used to grind solid ingredients such as coffee beans, grains or spices. Knife blade: Most food processors have a multi-purpose knife blade that is used for mixing, mincing, mashing puréeing and chopping. Dough blade or hook: This is usually a blade that attaches to the food processor bowl, and is used to make pizza doughs or pie crusts. Shredding and slicing blade: Many food processors come with several sizes of shredding and slicing blades for different consistencies. Chipping blade: A chipping blade usually attaches to the food processor, and is used to make homemade chips or french fries. Grating blade: A grating blade attaches to the food processor and is used to shred cheese or vegetables. Potato rasp: A potato rasp is used to finely grate hard vegetables such as potatoes or hard cheeses such as Parmesan. Beater: A beater, or whisk attachment, is used to make whipped creams. Feed tube: A feed tube usually attaches to the top of the food processor bowl, and is used to feed in food during mixing. Matching Spatula: Some systems come with a matching spatula, which is sometimes designed specially for use with the appliance. There are a few additional features that aren’t completely necessary, but may make using your new appliance easier. These include a citrus press or juicer that allows the machine to be used as a juicer, a straight-sided processor chop and micro-serrated blades that don’t need to be sharpened. Some systems have safety features such as auto shut-off and auto-lock. The auto-lock function may be important if you have young children at home. In the end, it all comes down to what you plan to do with your appliance. That's why in the buying guide here, I've covered in detail the different uses and considerations. I hope I’ve been able to shed some light on which models might be ideal for your needs, and on what to look for as you make your selection. If you're not sure if you need a food processor at all, and rather invest in a good blender, then check out our blender buyer's guide here. Why buy two appliances when you can enjoy the versatility of a blender-food processor combo! Check out our reviews and top picks of the most popular systems. We also guide you on how to choose the right appliance for your needs!